A calm trading session is expected today, following solid gains of British pound due to U.K. CPI report. Meanwhile, the U.S. dollar was under heavy pressure as Trump’s administration plans may face difficulties. Euro was traded mixed versus the other majors due to the absence of macro data. 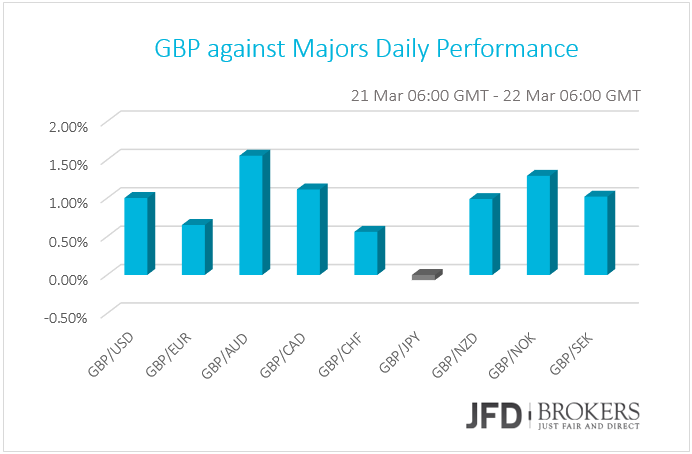 Tuesday has reversed the slight sterling losses recorded on Monday and boosted the currency severely against all the G10 currencies with the exception the Japanese yen. On Monday, the announcement that Brexit complex negotiations will begin next Wednesday, March 29, added a slight pressure on the British pound. But, on Tuesday and early Wednesday, the currency consolidated gains following the U.K. CPI report which revealed even steeper pace of rising of the consumer prices at 2.3% year-over-year in February from 2.1% the previous estimate and 1.8% in January. The annualised figure had also risen to 0.7% versus the expected 0.5% raising the speculations for a rate hike. Later on, pound’s rally affected by BoE Governor Mark Carney’s speech who repeated that the rise in inflation is not solid and the central bank will not react for now even if inflation met BoE’s 2% target. However, we believe that policymakers will not shrug off to the increased consumer prices in a period with stagnated wages. 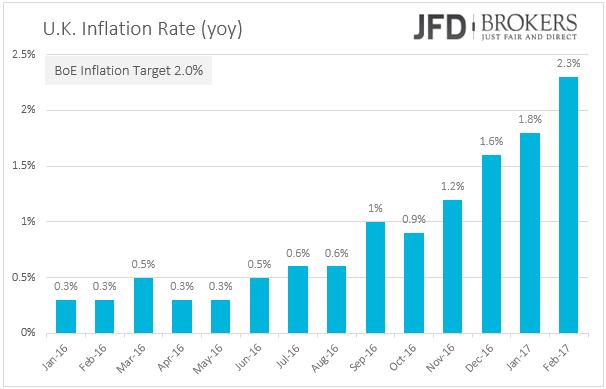 They may be reluctant to raise rates now, amid political and financial worries coming from U.K.'s exit from the European Union, but if inflation rate continues to expand at this pace will decrease consumer demand. Thus policymakers must consdider possible measures to keep inflation on track. 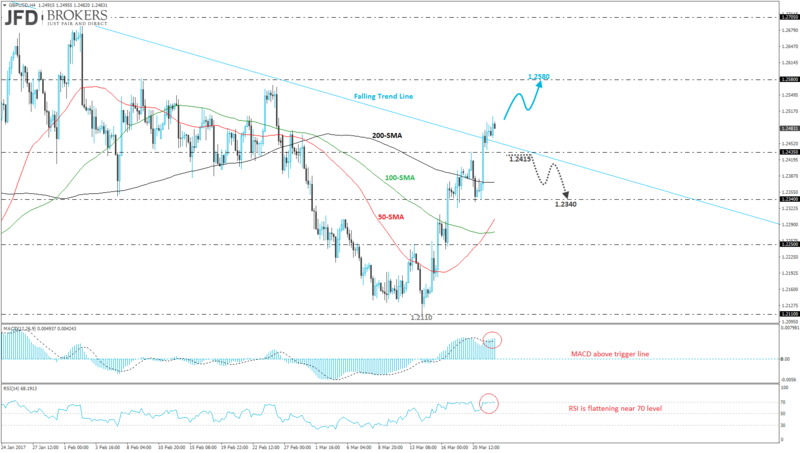 The GBP/USD pair is trading higher since late February and climbed above the descending trend line that was holding since September 2016 as well as it rose above the 50 and 100 daily SMAs. 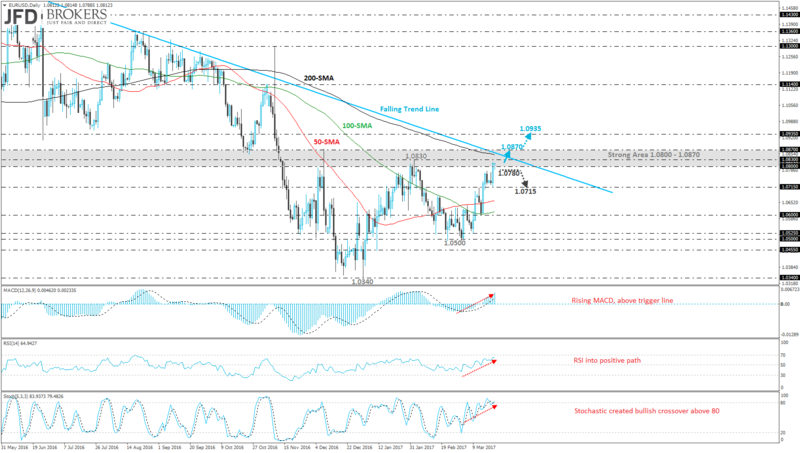 Sterling added more than 1% at its value since Tuesday and is approaching our recommended target on a previous analysis at 1.2580 (see technical analysis here: https://bit.ly/2n3bPGY). The British pound soared after the release of U.K. inflation data and surged nearly 150 pips at 1.2500. Despite that, a free fall below the 1.2435 support barrier would open the door for the 1.2340 price level. The technical structure on the short-term timeframe suggests further upside movement. The MACD oscillator is trying to insert the positive territory and is moving above the trigger line. The RSI indicator is trading within the 50 and 70 level with no clear directional strength as it is flattening. Going to a lower timeframe, MACD jumped above the trigger line, however, the RSI indicator is flattening near the overbought zone. The U.S. dollar dropped against most of its peers from raised concerns that the U.S. President Donald Trump administration may face difficulties. Against the basket of major currencies, the U.S. dollar hit 7-week low levels as market participants have signs that the increased infrastructure spending and the rate lowering of taxes the president promised will to take place as soon as was expected. No other data released yesterday from U.S. or Eurozone to influence the currencies. On Tuesday and early Wednesday's trading sessions, the euro was traded mixed against its G10 counterparts. Later in the day, the U.S. housing market data is scheduled for release. U.S. dollar’s bearish run extended to a new almost four-month low at 111.42 against the Japanese yen. 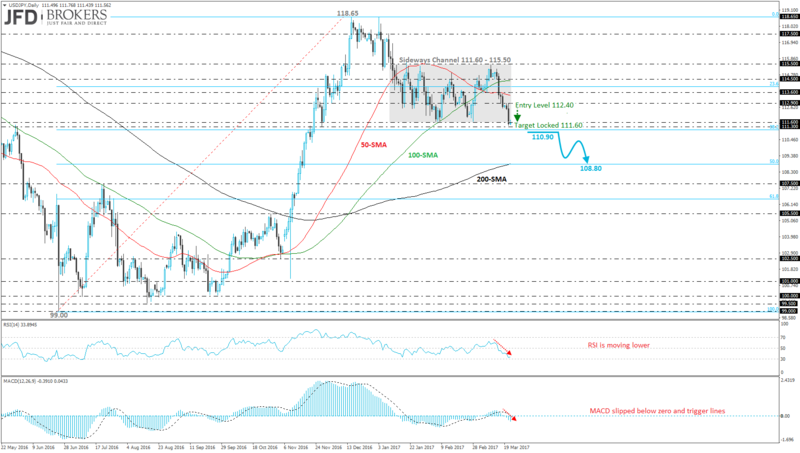 Since last week, the USD/JPY pair dropped more than 2.8% and reached our suggested target that we mentioned in the previous analysis at 111.60 (see technical analysis here: https://bit.ly/2mo4p3U ). The currency pair slipped below the sideways channel 111.60 – 115.50 that was holding the last eleven weeks and now is developing within the 111.30 – 111.60 zone. If there is a penetration below the latter obstacle, it would open the way for the 200-daily SMA near 108.80 which overlaps with the 50.0% Fibonacci retracement level of the last upward move with low on June 24th of 2016 and high on December 15th of 2016. Otherwise, a jump above the 111.60 strong barrier, it will expose the price towards 112.90. On the daily chart, technical indicators are endorsing the bearish scenario as both are following a negative path. The RSI indicator after the rebound in the positive territory fell and now is approaching the oversold area. The MACD oscillator plunged below its trigger and zero lines and its momentum is strengthening over the last days for further downward move. Euro traded sharply higher against the greenback during yesterday’s period as it rose more than 0.6% and surpassed the 1.0800 significant psychological level. Also, the EUR/USD pair is recording the fourth positive consecutive week while it remained slightly below the 1.0830 resistance barrier and failed to reach it. Technical indicators are signalling for further rising move, however, the descending trend line on the daily chart that is standing since May of 2016, it seems to be a strong obstacle for the bulls and it needs a strong push for an upward run. The next levels to watch to the upside are the 1.0870 resistance handle and the 1.0935 barrier. If the price fell below 1.0800, it will hit again 1.0715. From the technical point of view, on the daily chart, the MACD oscillator is moving with strong momentum higher and is developing above its trigger line. The RSI indicator is approaching the overbought zone and the 70 level. In addition, the stochastic oscillator created a bullish crossover within its moving averages into the positive territory indicating bullish movement. Wednesday is quiet overall with limited affecting data. Eurozone’s current account is coming out while U.S. housing price index for January and existing home sales for February will be released. Swiss National Bank Quarterly Bulletin report will attract some attention while the big event of the day is Reserve Bank of New Zealand’s interest rate decision. The central bank is not expected to change its interest rates from 1.75%, however, traders will expect to hear how the fall of the oil prices affected the economy.